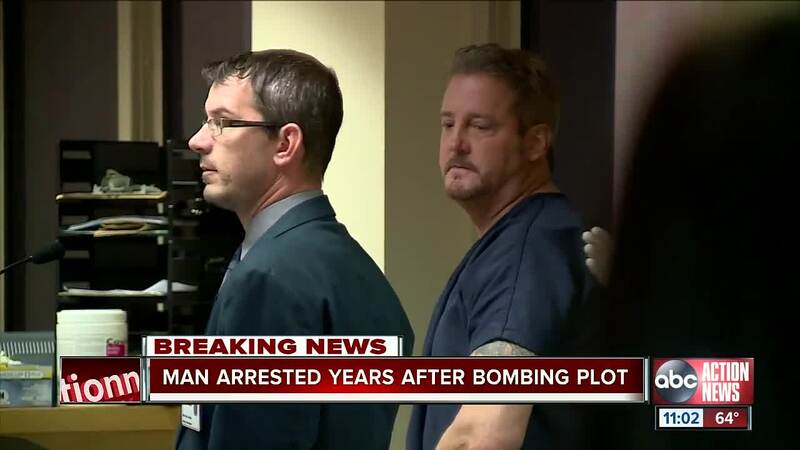 A man convicted of a bomb plot targeting 50 mosques in the Tampa-St. Petersburg area, and in other parts of Florida as revenge for 9-11, has been arrested in South Florida on weapons and domestic violence charges. According to Tequesta Police, they are looking into the possibility that Robert Goldstein, 54, may have been plotting a bigger crime when he was arrested on multiple weapons charges this week. Goldstein has been charged for domestic violence with strangulation and for being a convicted felon with firearms. Officers responded to his home on Live Oak Circle on Thursday after he barricaded himself in with his stepdaughter. Officers rushed into the room when they found out he had a gun. Authorities removed his daughter and told Goldstein to come out. He surrendered without violence. Officers found 13 handguns, 30 firearm magazines, one stun gun, four flash bang grenades, two novelty style hand grenades and 142 rounds of ammo. Tequesta PD says he used his wife's identity to buy the guns. Authorities contacted the Bureau of Alcohol, Tobacco, Firearms and Explosives. “The Incident and follow up investigation are an example of great police work by the Tequesta Police Officers and partnerships that included the ATF, Palm Beach County Sheriff’s Office, Tequesta Fire Department and Palm Beach County Fire,” Chief Gus Medina with the Tequesta Police Department said. In 2002, Goldstein was convicted on three charges including conspiracy to violate civil rights, attempting to damage religious property and possession of unlicensed bombs. He was sentenced to nearly 13 years in prison after pleading guilty. According to the ATF, local authorities found 37 explosive devices, instructions on how to build bombs and schematics detailing a plan to bomb a local Islamic education center. Also arrested in the plot were his wife Kristin Goldstein, and his accomplices Michael Hardee and Samuel Shannahan. According to the Associated Press, Goldstein's former attorney, Myles Malman, claims his client suffers from severe mental illness. Police found a "mission template" in Goldstein's home outlining plans to shoot Muslims with high-powered weapons. Malman told the AP in 2002, Goldstein planned to bomb the Islamic Society of Pinellas County mosque and cultural center to destroy the building and not to kill the people. During his 2002 arrest, authorities found at least 15 finished explosives and enough material to make 40 more. Goldstein is currently on federal hold at the Palm Beach County Jail.